Show Your Friends How You Roll! Celebrate your special day with bowling, dining, and gaming. All Star makes a memorable venue for birthdays, anniversaries, family reunions, bachelor/bachelorette parties, holiday parties and other celebrations. Get your group together for good times at All Star. It's easy to have an over-the-moon celebration! 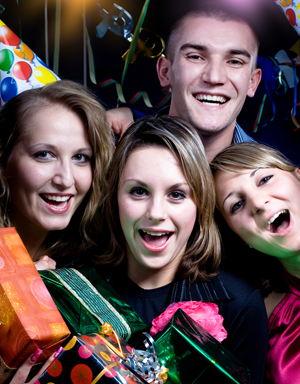 Choose from either our standard party packages (shown below) or create a custom event. Adult bowling parties have a minimum of 10 people. Parties are two hours in length and can be scheduled for any day of the week subject to lane availability. A $5 per person surcharge will be added for parties that overlap or occur during Rock 'n Bowl sessions. Reservations must be made at least one week in advance and require a $50 deposit. With the exception of birthday cake, outside food or drink is not permitted in All Star. You can make an adult party reservation for groups of 10-25 people as well as check date/time availability using our secure online reservations system. If your group size is above 25, please use the Book a Party contact form to get the ball rolling. Call 692-5760, click, or come by for more information or to schedule your celebration. *Prices do not include sales tax and gratuity. A $5 per person surcharge will be added for parties during Rock 'n Bowl sessions.